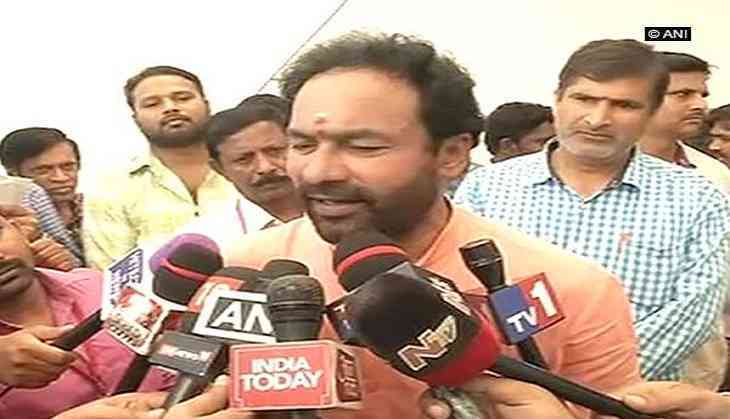 Bharatiya Janata Party (BJP) Telangana president G Kishan Reddy on 27 October said that there should be no religion-based reservations in India. "Baba Saheb Ambedkar had also said that there would be no reservations in the name of religion," Kishan Reddy said while addressing the media here. "The 4% Muslim Minority issue that has been going on, its judgment should come soon. Our government went to the Supreme Court over the 4% quota. According to me, there should not be even a question about the implementation of 12% quota for Muslims by the BJP-ruled Central government. If this is TRS's agenda, then we have an agenda as well. We have repeatedly said it that minority should not be involved in the office. Work on developing minority, but they should not stay in the office. Giving 12% reservation is very wrong. Baba Saheb Ambedkar has also said that there will be no reservations in the name of religion," he said. "Telangana Assembly session started from today. Yesterday, in the BSE meeting, the Chief Minister and the speaker told us that this will go on for fifty days. We have given a list of issues, including unemployment and corruption in the irrigation department, that we want to be discussed in the assembly," he added. The Telangana government had passed a bill in April 2017 increasing reservation in jobs and education for backward Muslims to 12%, exceeding the Supreme Court's 50% ceiling for such benefits.